“Digital Film” — just a fantasy? « efix:photography – News. Thoughts. Pictures. “Digital Film” — just a fantasy? Definition: A film cartridge containing a digital image sensor, to be used in analogue film cameras. This is a concept enthusiasts were longing for since the beginning of digital photograhy. In fact, the first DSLRs from Kodak weren’t real DSLRs, but analogue Nikon SLRs equipped with a digital module. Of course, these units were bulky and unpractical, but they made it into history books as being the first actual digital SLR cameras. Nikon F90 SLR with Kodak DCS digital unit. Picture courtesy of Wikimedia. Shortly thereafter, the first concepts were made for fitting a digital sensor into a much smaller unit, such as a film cartridge. Some problems come in hand with such an approach, though. For one, you have to decide whether you want to create a “real” film cartridge where the sensor is contained in the cartridge and pulled out — just like film — to put it into the camera. Back in the 90ies, the technology to do this just wasn’t there. 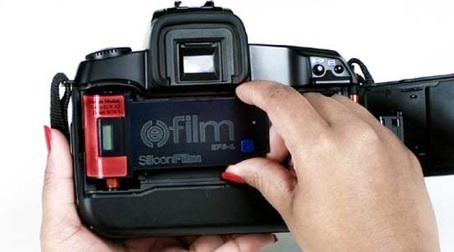 The other possibility is to create a cartridge like that used for 110 film, where the sensor is fixed in a slim shell outside the actual cartridge. This was actually tried with “Silicon Film” in the late 90ies, without much success, though. An "e-Film" cartridge fitted into an analog SLR. Picture courtesy of Dead Media Archive. The problem with the first variant is that you need a sensor that is flexible enough to be spooled up inside a film cartridge, yet durable enough not to be damaged permamently. 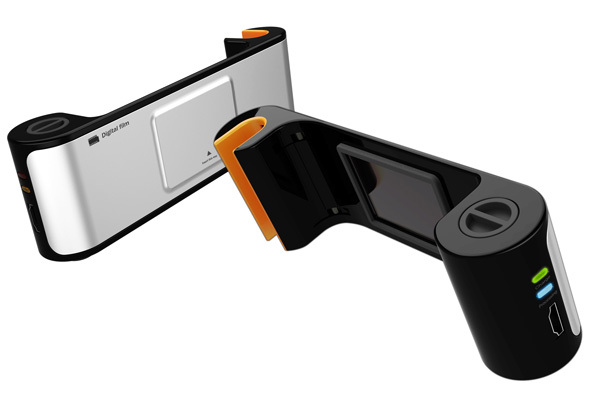 The problem with the second concept (demonstrated by e-Film above) is that the shell containing the sensor must be slim enough to fit into the back of a camera, where there really isn’t much space once the door is closed. I don’t believe that either of the issues has been solved yet, as otherwiese digital film might already have become reality. Yet, just recently two new concepts were announced — just to prove that there would still be a market for digital film. One of those concepts is RE35, which fits a flexible sensor plus batteries and electronics into a standard 135 film cartridge. The product was announced on April 1st this year, so it really wasn’t meant to be realized … sadly, as there was a huge a mount of positive response. RE35 digital film cartridges. Picture © Rogge & Pott Design. The other concept that was just announced features a 110-like cartridge that fills the entire back of the camera, fixing the sensor in a slim case between the actual cartridge and a part that locks into the camera’s film spool. This concept was created as an entry for this year’s iF design awards, and clearly is a response to the recently revived discussion of the topic. Well, maybe all this fantasizing serves one purpose: to show manufacturers that there is a market for such products, and to encourage researchers to come up with new ideas and concepts how this could be realised. In fact, I’d love to see digital film become reality in the near future, as I think it’s just a brilliant idea. Many analog film bodies are decades old and still working like swiss clocks. Why not continue to use them? Sure, you can still run film through them, but what if you prefer to shoot digital? With digital film, you could to both — use your old Leica M3 or Nikon F or Pentax ME or whatever, and take digital images. Why not? 10 comments to “Digital Film” — just a fantasy? I’m sure a lot of people would love to see this become reality! I would love to see something like this come to fruition. I have an old MF Nikon for the early 90’s that takes great pictures. WOW then we really would be able to have a digital CL! I’d rather have a real digital CL … But of course that whole idea is pretty smart. I really hope they manage to actually do this one day. PLEASE MAKE THE CARTRIDGE ONE! I WANT TO USE MY AWESOME FILM CAMERAS LIKE DIGITAL! Allen, you can use your Pentax 110 lenses on Micro Four Thirds cameras. The MFT sensor is the same size as the 110 film, so you won’t get any vignetting. Also, size-wise, this makes a nice package.